Arasan Ganesan Polytechnic College has a wide area of sprawling 50 acres green campus. It is situated 9 km. from Sivakasi town on Sivakasi -Virudhunagar main road. The polytechnic had a remarkable growth during the last thirty years. Started with just two Diploma programmes in Civil Engineering and Electronics and Communication Engineering and a student strength of 100, it has now grown up into a co-educational institution with a total annual intake of 420 and caters well to the technical education needs of the rural areas of Virudhunagar district. The emblem in its entirety depicts a wheel, the symbol of progress, with Arasan Ganesan Polytechnic College at its hub. The spokes double as rays of knowledge with arrows emphasizing their distinctive nature and spreading in all the directions from Arasan Ganesan Polytechnic College to dispel ignorance. 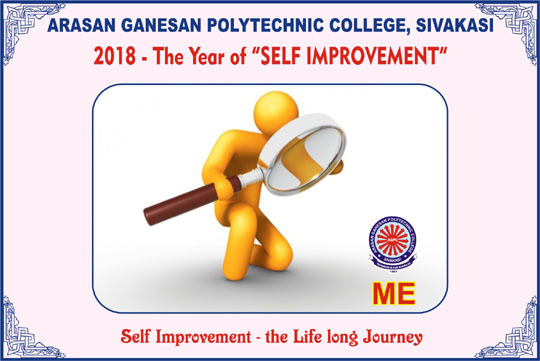 Arasan Ganesan Polytechnic College, by its motto, is committed to progress of society, of nation and of mankind. 28-12-2018 Motivational Lecture for PWD stud. Arasan Ganesan Polytechnic College, a Government aided co-educational Institution, is to offer Diploma programmes in Engineering and Technology, approved by AICTE for the post-secondary students admitted as per Tamil Nadu Government norms adopting curriculum and evaluation system stipulated by Board of Technical Education. It also offers consultancy services and need-based courses for the up liftment of the society through various programmes by optimum utilization of available resources. Be a role model and pioneer institution in the technical education.